The sport of track and field dates back to ancient times, but female competitors have been a relatively new addition limited to the last hundred years, with only a few exceptions. Held in 776 BCE, the first Olympic Games included a 192-meter foot race, and ever since then the Olympics have served as track and fields most important arena (where the sport is called Athletics). However, participation in the ancient Games was originally limited to men (married women werent even allowed as spectators). Greek women participated in other sports festivals, though, and staged their own foot race at the Heraean Games, which, like the Olympic Games, were held at Olympia every four years. There, unmarried women, wearing robes that covered only one breast, ran in a 160-meter race. Track and field effectively died out after Roman emperor Theodosius I ended the Olympic Games in 393 CE because he thought the Games had pagan associations. The first modern Olympics, held in Athens in 1896, marked the reemergence of the sport-once again without any female competitors. 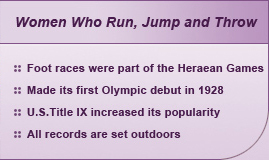 Though still excluded by the Olympics, there were (just as in ancient times) female runners. A year earlier, on November 9, 1895, Vassar College in Poughkeepsie, New York, had organized the first all-female track meet. Twenty-two women competed in five events, and no male spectators were allowed. Several other colleges began womens track programs as well, much to the chagrin of doctors who claimed that running and other types of rigorous physical activity had an adverse affect on a womans childbearing abilities. 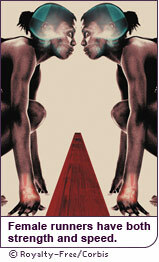 By 1923, the sports governing body in the United States, the Amateur Athletic Union (AAU) began sponsoring a national championship track meet for women. Five years later, womens track and field made its Olympic debut in Amsterdam, with a modest program of five events (compared to 22 for men): the 100-meter dash, the 800-meter run, the 4x100-meter relay, the high jump and the discus throw. Getting womens track on the Olympic schedule legitimized female participation in the sport to a certain extent, but it was only the first victory of many to come that would overcome the sports long-standing gender bias. 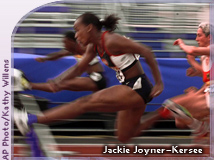 Throughout the sports history, both the IOC and the AAU limited the number of womens events, operating under the cultural notion of the time that women werent physically capable of competing at longer distances. Also, fervor after the 1928 Olympics proved that people werent ready to see women huff and puff in public the same way male competitors could. After several competitors failed to complete the womens 800-meter run at the 1928 Olympic Games, organizers dropped the event until 1960. 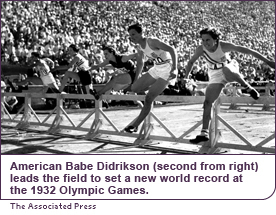 In fact, from 1932 to 1952, there were no Olympic races for women longer than 200 meters. The 400-meter run, a staple of any track meet, didnt become an Olympic event for women until 1964, and the 1,500-meter run, the metric equivalent of the mile run, wasnt added until 1984. Three distance events were also added to the Olympic program during the 1980s: the 5,000-meter run, the 10,000-meter run and the marathon. As opportunities for women in the sport have increased, female track-and-field athletes have gained much-deserved international fame for their impressive strength and speed. In 1972, the passage of Title IX in the United States gave the sport a growth spurt. American high schools and colleges began adding track programs for girls and women or expanding existing ones. The schedule for womens meets mirrored that of the mens, and today most track meets feature the same events for male and female competitors (with a few exceptions). Aside from the Olympics, the sports most notable competitive event is the world championship held every two years. Womens Olympic track (running) events include sprints (100-meter, 200-meter, 400-meter), middle-distance races (800-meter and 1,500-meter) and long-distance races (5,000-meter, 10,000-meter and the marathon). There are also relay races and hurdle events. Jumping events include the high jump, long jump, triple jump and pole vault. The throwing events are javelin, shot put, discus and hammer throw. 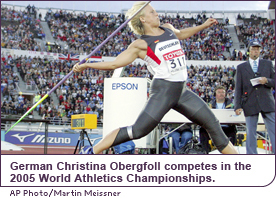 There is also a 10-kilometer walking race for women and the heptathlon.